Add a dollar amount to your CLINK!. The recipient can redeem the gift value with a merchant for goods and services, or cash out to a preferred account: bank/debit/credit card. Sign-up for CLINK!Gift with name, contact email, and phone number. Verify your email address and your account is all set. The app then displays a screen with an explanation on how to create a CLINK! custom card. First, take a photo or choose one from your photo library. There are also some stock ones available in the app that can be used. 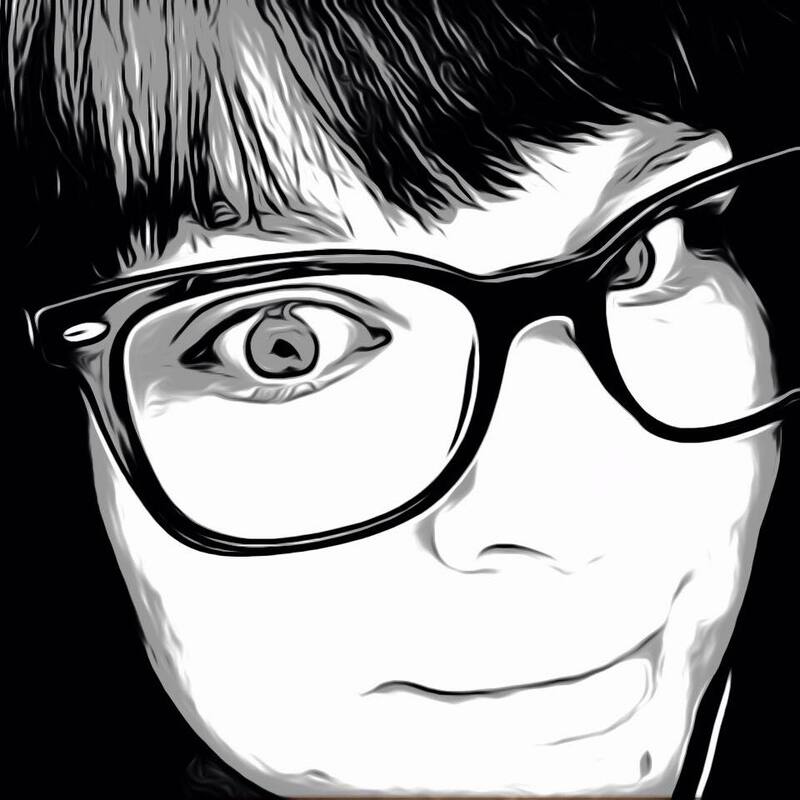 Next, personalize the photo with some text, drawing, or even a filter. Address it to a contact from your device by syncing your contacts from the phone to Clink!Gift, and then select the recipients. Once selected, choose to send as is, or add an optional gift or include a dollar amount. Gifts can be searched by available merchants and partners in the area. Once perfected, send your CLINK!. Friends will receive their CLINK!Gift to their email address or phone number. 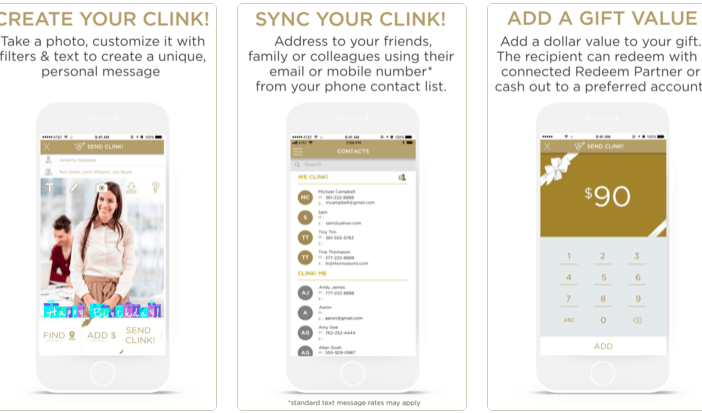 Any gifts and monetary values can be redeemed in the CLINK!Gift app or on the website, www.clink.nyc. They can also see the CLINK! in their home feed in the app, like a social media feed. The receiver can send a CLINK! back or add a comment and like to the CLINK!. Other contacts can also see these unless it is sent privately. These can be shared to social media accounts including Facebook, Twitter, and Instagram. 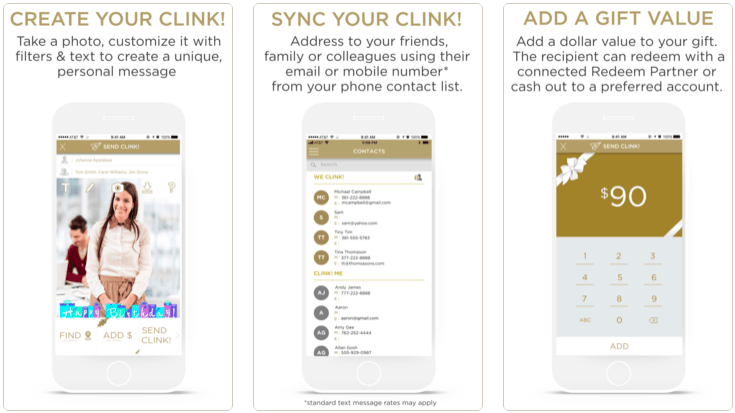 CLINK!Gift can also be used for charity and non-profit organizations to invite others to donate for their favorite causes. CLINK!Gift app seems to have a lot of functions. It is a digital gift card service with a social media flow, but also includes a fundraising campaign option. It is a bit confusing to use at first but once you understand what they are going for, it is a pretty interesting service. I like the idea of being able to quickly create and send a virtual gift to recognize someone or raise money and awareness for charity. At this time there aren’t a lot of merchants in my area, so I hope in time that will change. 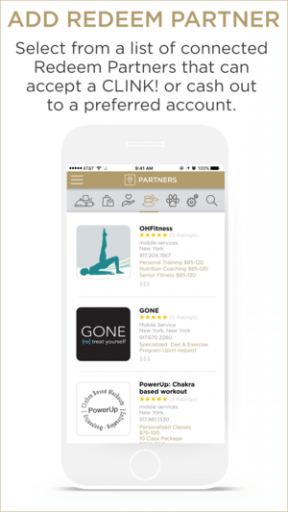 On a side note, there is the ability for users to join as a partner as well to be added for others to redeem CLINK!Gifts for their businesses, which includes partner promotions and advertising opportunities. Show the ones you love with a CLINK!Gift. The app is available now for free in the App Store.